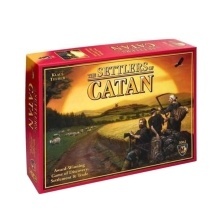 The players in the game represent settlers establishing colonies on the island of Catan. Players build settlements, cities, and roads to connect them as they settle the island. Come and have fan! Exquisite color box packaging, can be taken as a gift to friends. Fun and easy to learn, keep advanced players on their toes. Players have strategic and diplomatic aspects and the ability to randomize the game. Can be played time and time again without feeling repeated or bland. A great board game in a party activity for family or friends.